Thomas Plenert was born in Nauen (former GDR), in 1951. He commenced his studies at the Konrad Wolf University for Film and Television in Potsdam before transferring to, and graduating from, the renowned film university in Lodz, Poland. His camera work has been highly praised for its lyrical qualities in documentary films such as Jürgen Böttcher’s »Rangierer« and »Die Mauer«. 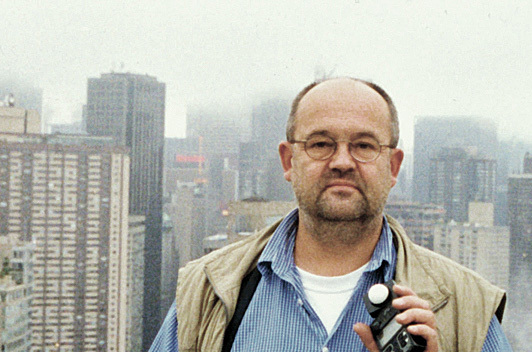 He quickly became one of the most experienced camera men in German cinema. In 1988 he worked on Volker Koepp’s short documentary »Feuerland«. This was the beginning of a life-long cooperation; Plenert has since been Koepp’s camera man on almost all of his films, and his work on Koepp’s »Kalte Heimat« (1995) was distinguished with the German film award. Although he came to fame for his documentary work, Plenert has also worked as a feature cameraman. The naturalistic character of Schütte’s homeless people drama »Fette Welt« (1998) can be ascribed to him. He has also filmed several episodes of the crime film series »Polizei Ruf 110«, receiving the Grimme prize (2006) for »Kleine Frau« by Andreas Kleinert. Plenert demonstrated his sovereignty in switching between these two cinematic forms in the cinema season 2007/2008, when he worked on both Bernd Böhlich’s highly praised social comedy »Du bist nicht allein« and also assumed responsibility for camera work on Volker Koepp’s »Holunderblüte«.